Sidcup is an urban district of South East London, England, in the London Borough of Bexley. 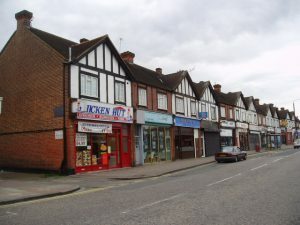 Sidcup lies on the borders of the London Boroughs of Bromley and Greenwich. The renowned Queen Mary’s Hospital is located within the town. Sidcup can be reached by car via the A20. Sidcup has excellent public transport links and Sidcup station runs regular services to London Charing Cross and London Cannon Street. Lanes School of Driving was established way back in 1914. Since then it has distinguished itself as a centre for excellence in driving instruction. Lanes provides each prospective pupil with an individually tailored course. Intensive driving courses are available for those who want to make progress fast. Theory classes are offered either alongside practical lessons or as a separate course. When pupils have passed their test, they can further their learning with a range of after pass courses. These include: Pass Plus, Motorway Driving, Parking Skills, and Advanced Driving. Pupils often lead hectic lives and Lanes offers great flexibility in timetabling lessons. Regular weekly classes are offered as well as single one-off lessons. Lanes is committed to offering pupils one on one lessons. This ensures that pupils do not have to share their instructor with other pupils, ensuring the optimum learning experience. Lanes is proud to have an array of excellent modern vehicles for our pupils to enjoy. For maximum convenience, Lanes offers pupils the option of being collected and dropped off by their instructors. Lanes have been providing driving lessons in Sidcup, London for many years. Please call us today on 020 8166 5678 or click here to send us an email via the contact page. There are over 40 experienced driving instructors working at Lanes. Pupils can choose the instructor best suited to them. Students of varying age ranges – from age 17 to age 70 and over – have been successfully taught by our instructors. Instructors are conscious that first-timers can be anxious and will be able to offer reassurance. Each instructor is an Approved Driving Instructor and is registered with the DSA. At Lanes, every pupil will retain the same instructor throughout all their lessons to ensure continuity of instruction. Lanes have a team of driving instructors in Sidcup, London. Please call us today on 020 8166 5678 or click here to send us an email via the contact page. Learning to drive is often stress-inducing. Female drivers can be self-conscious and shy in front of a male instructor. Lanes is pleased to be able to offer female driving instructors on request. Our female driving instructors take a relaxed and easygoing approach. They take care to ensure that their pupils do not feel pressured in any way. Lanes have a selection of female driving instructors in Sidcup, London. Please call us today on 020 8166 5678 or click here to send us an email via the contact page.